If you’re one of the 13 million Americans who have survived a heart attack or been diagnosed with heart disease, Dr. Janet Bond Brill offers a delicious and foolproof plan that can lower your risk of a second heart attack by up to 70 percent. Inspired by the heart-healthy Mediterranean diet, the Prevent a Second Heart Attack Plan is based on satisfaction, rather than deprivation. Packed with every tool you need to eat your way to better heart health--including daily checklists, a complete two-week eating plan, and dozens of mouthwatering recipes to suit every meal, taste, and budget—Prevent a Second Heart Attack provides you with the knowledge, skills, and confidence to live long and enjoy the good life, the heart healthy way. JANET BOND BRILL, Ph.D., R.D., LDN, is a diet, nutrition, and fitness expert who has appeared on national television. She is the author of Cholesterol Down: 10 Simple Steps to Lower Your Cholesterol In 4 Weeks Without Prescription Drugs, and specializes in cardiovascular disease prevention. Dr. Brill lives in Pennsylvania with her husband and three children. Janet Bond Brill, PhD, RD, LDN, is a leading diet, nutrition, and fitness writer. A guest nutrition and health expert on national television, she is the author of Cholesterol Down: 10 Simple Steps to Lower Your Cholesterol in 4 Weeks Without Prescription Drugs. Dr. Brill specializes in cardiovascular disease prevention. She lives in Pennsylvania with her husband and three children. Annabelle S. Volgman, MD, is a professor at Rush University Medical Center in Chicago, Illinois. Dr. Volgman’s primary specialty is cardiovascular disease. She studied at Columbia University College of Physicians and Surgeons, was a resident at the University of Chicago Medical Center, and was a fellow at Northwestern Memorial Hospital. 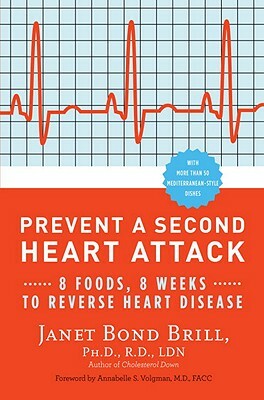 She wrote the foreword to Prevent a Second Heart Attack: 8 Foods, 8 Weeks to Reverse Heart Disease.